Music is what keeps me going. Even if you can’t tell it on the outside, I am seldom without music running through my head. Everything brings up a song for me it seems. So when Gena Mayo, who blogs at I Choose Joy, asked me to review her new music appreciation course, I was thrilled to do so. 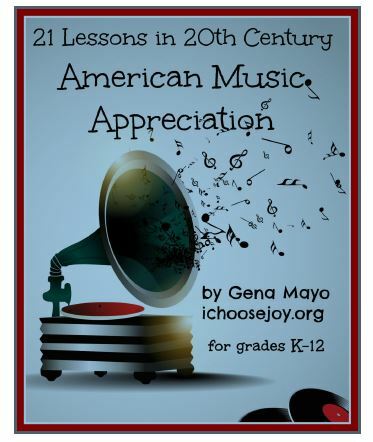 Gena wrote and taught 21 Lessons for 20th Century American Music Appreciation to a group of homeschooled students at a co-op class. It was designed to be done in 21 lessons that run about 20 minutes each. That is a nice, short, manageable time period if you are at all apprehensive about teaching music appreciation. As a quick overview, 20th century music runs from the tail end of the 1800s through the 1900s. You’ll experience the development of some distinctly American styles such as ragtime and jazz, as well as some of the more world-wide styles like minimalism and big band, though America developed her own version of those styles as well. You will run across names you know such as Louis Armstrong, George Gershwin, Cole Porter, Elvis Presley, and more. You will also come across composers and performers that you are less likely to know such as Philip Glass and Ferde Grofe. One of the very unique aspects of Gena’s curriculum is that it contains a large number of musical examples that are easily accessible. You wouldn’t think that was unusual for music curriculum but, really, it is. 21 Lessons is a download that you access online. It is a PDF file that opens with clickable links. Those links will take you to YouTube videos and other resources to be able to hear the music being studied. That is a huge bonus when you are talking and discussing the development of style and the differences in such styles as jazz, cool, bebop, and the early rock. Or when you are looking for the differences between stride and rag. At the end of the curriculum, Gena has included blank copies of the notebooking and listening pages that she developed to help the students focus on what they are learning. She also discussed how she modified the lessons to work from young elementary ages all the way through high school. This is a comprehensive study. Gena did a good job with the curriculum, in my opinion. Yes, there are things that I would have done differently were I to have written it but that comes from the difference in my musical background and Gena’s. I am an instrumental and folk music person; that is what my degrees are in. I am probably a bit more familiar with definitions and performance of some of the instrumental pieces so I might have tackled them differently. Gena has a much better grasp on the vocal aspects of the music of the 20th century than I ever could. Her knowledge and experience shows in the creation of this music appreciation curriculum. I think this curriculum will be a huge bonus for home schoolers or co-op classes that have a desire to incorporate music into their study. It doesn’t require a large amount of time or preparation since Gena planned it to be done in 20 minute segments and has included all the links you would need if you are connected to the internet. 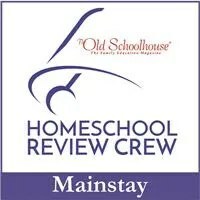 Please visit Gena’s site to find out more about this curriculum. If you purchase before August 31, 2015, you can receive 50% off the cost of the curriculum. Just enter coupon code: August50. Thanks for your review. I’d love to talk to you about how you would tackle things differently before I get the next volume ready! You’re welcome! I’d be happy to chat with you. I’ll send an email.